It was the time for revolutions—the Industrial, the American, and the French. While the world was restructuring, the Classical period emphasized stability, less complication, and balance. During this time, the string quartet and symphony became popular musical forms, opening an even larger compositional landscape for both the composer and the listener. 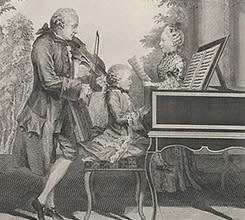 Harpsichords were replaced by pianos, while melodies soared out of scores. Simplify your evening with a Peace Interlude. Peace Interludes - New this year!